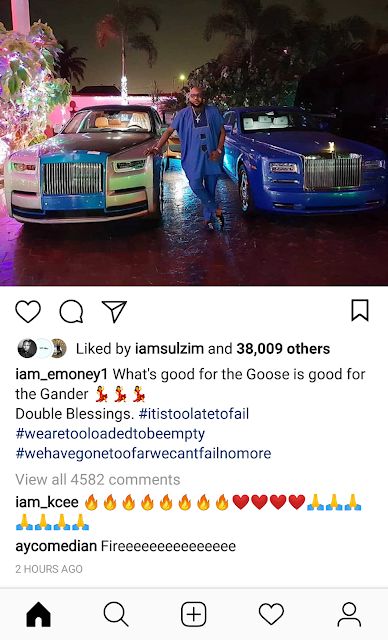 Record Label Owner E-money has bought himself a Rolls Royce as Christmas gift, days after surprising his wife with a Rolls Royce Phantom. This guy's own pass blood money abeg! Such money no be clear eye abeg. You be zuckerberg? Even zuckerburg no get two RR. Emoney just be careful,boys are not smiling. This constant show of wealth. I fear for your families safety. Still nobody can answer this question, how does he make his money I am asking again. I cannot congratulate you when I do not know your source of income. Anon 20:53 your head dey there. 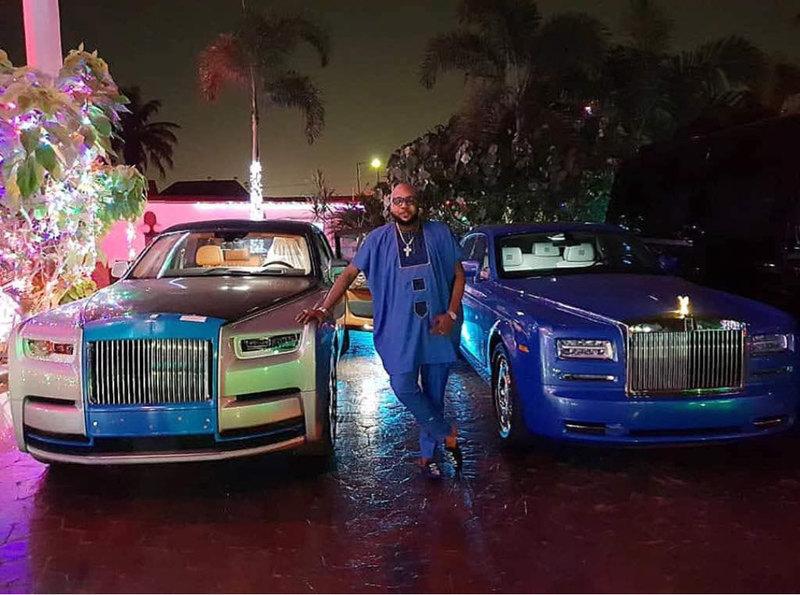 These Rolls-Royces e-money is buying are not new and they’re not even recent editions.. When blood money pass blood money. If you've watched Ozark, you'd have an idea of what he does. Currently watching Ozark but this one pass Ozark. E-Money is a ritualist. When you want to do blood money ask yourself Will I Be Richer Than E Money? If the ssnswer is No, my brother better become a farmer. Dear Lazy Nigerian youth he has a shipping line, his ships lift crude oil for Ex Generals with oil bloc. He has a clearing agency for haulaging goods. To lift a 20ft container containing electronic items from Tincan wharf to Alaba International market costs N900,000. He makes millions daily. Anonymous Ode like u,not everyone is as gullible as you are.We believe you o!He owns all the manufacturing companies in Ikeja and owns two oil blocks as well. What is his source of income? Just being curious. E-money is also a clearing agent, but does the bad side of clearing if you know what i mean. I am beginning to question this Emoneys cash o. Please do they ever drive these cars in Lagos with the bad roads? What does emoney do for a living? Even me,I like it how he shows her love mehnnnn. Even if side-chick dey, she will know madam is his No1. Pls is Kcee still married. Often see his wife with Emoneys wife. Seems they are bestie. Long time, aya melaye. Lolz, don't mind me jarey; just messing about. Stupid question after stating this. @Pls is Kcee still married. Often see his wife with Emoneys wife. The fear of Anambra business man is the beginning of wisdom. They can do anything for money. Poor people like me be shouting blood money Upandan. Is it your blood? 'Stop jealous' biko. My dear even the billionaires in this country get one Rolls Royce in their fleet. I'm yet to see anyone buy two together or weeks apart. I know Subomi Balogun of FCMB has one; A white. I know Hajia Bola Shagaya has a silver one if I'm not mistaken. I never see anyone buy 2 same time. So ppl need to ask abeg. E-money congrats. We are not hating I especially like the fact he bought one for his wife. The way he loves her is commendable and no reasonable woman can hate on that. Have you heard about Bolu Akin-Olugbade? He has 10 Rolls Royces in and out of Nigeria. So relax, e-money is still a small boy with his “packaged” Rolls Royces . Stella do you even know what brand new is? Bed and Roses, what of Olu Okeowo? Congratulations, but bros abeg no make our wives begin see us like uncaring husbands with the small Mercedes Benz that we are gifting them. I know women can compare. Help the association of Non-RR owning husbands to save our marriage🐒🐒🐒🐒🐒🐒.